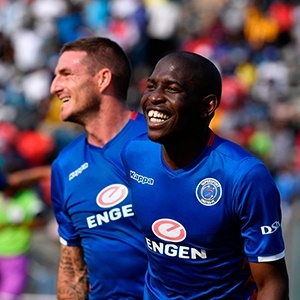 Cape Town - SuperSport United and Polokwane City played out to a boring 0-0 draw in a match that both sides needed to win, but neither looked particularly willing to take the risk. The Absa Premiership encounter at Lucas Masterpieces Moripe Stadium was vital to both sides as anything less than a draw would all but spell the end of any hopes, they would have of challenging for the title. Mathematically it is still possible for both, just not very likely. However, despite the apparent stakes before the match neither side looked particularly interested in sending too many players out of their own half. It was a tentative, measured and, well, boring affair in the end where both sides just looked terrified of losing. There were a couple of chances sprinkled throughout the 90 minutes to give the sparse crowd brief moments of excitement, but they were few and far between. The best chance of the first half came off the head of Aubrey Modiba just before half time as his effort beat the keeper but was cleared off the line by Ayanda Nkili. In the second half Polokwane retreated almost entirely inviting pressure onto themselves, but SuperSport's poor touch in the final third meant they didn't face too many chances. Matsatsantsa's midfielders ran themselves ragged trying to find an opening and looked dead on their feet by the final whistle, but it was all to no avail.